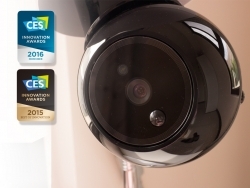 iCamPRO Deluxe, a cordless WebRTC home security robot with face detection and 360-degree auto-tracking, is selected as a 2016 CES Innovation winner. Amsterdam, Netherlands, December 25, 2015 --(PR.com)-- Amaryllo International B.V. (Amaryllo), founded in Amsterdam, the Netherlands, announces that its new home security robot, iCamPRO Deluxe, featuring real-time face detection, 360-degree motion-sensing network, full HD 1920 x 1080 resolution, and built-in artificial intelligence to automatically track moving objects, won an International Consumer Electronics Show (CES) Innovation Award. Over 20,000 new products are submitted to CES every year for award consideration, but only a handful of innovative products are selected to represent each product category. iCamPRO Deluxe is a top winner under the Embedded Technologies product category for its innovative robotics home security design and engineering technology, making Amaryllo two years in a row honored with CES innovation awards. Amaryllo iCamPRO series offers unique features allowing consumers to draw block-out or activity zones on their phones to define areas where consumers want robots to ignore or to focus. This option significantly reduce possible false alarm seen in most home security products based on audio or motion sensors. There is a “home” position where consumers can define from their smart phone such that the robotics camera will automatically return to a pre-defined angle by consumers after 10 seconds of no movement. The combined features enable each robot to safeguard owners’ most important properties at all time. Face detection furthermore detects the presence of intruders and dispatch real-time Face Alert to owners. Unlike any other conventional home security products, iCamPRO Deluxe is the first residential security robot with built-in artificial intelligence to self-respond to ambience. Embedded with high-speed multi-core CPUs, iCamPRO Deluxe employs world’s best 256-bit encryption technologies to ensure consumers’ privacy. Amaryllo’s dynamic P2P server automatically detects available bandwidth to adjust video quality to ensure the best possible streaming performance. iCamPRO Deluxe’s light-bulb base conveniently secures itself to typical light-bulb socket and drains power from it, making it completely cordless and wireless. Its full HD resolution enables iCamPRO to track moving intruders over 30 feet. iCamPRO has built-in motion and audio sensors and will send out real-time push-picture or video alerts to recipients anywhere, anytime. iCamPRO Deluxe can be programmed to automatically upload recorded video files to Amaryllo Cloud, which offers a free 24-hour unlimited cloud storage plan and an option to expand it to 30 days or even 365 days, so you can always play back recorded videos from anywhere in the world. “Our goal is to build smart and intelligent home security products for everyone that can learn, see, hear, listen and talk, thus surpassing all other security products,” said Kevin Pothoven, sales manager at Amaryllo. For more information on Amaryllo 2016 CES Revolutionary Smart Security Robot, you can take a look at its project at Kickstarter, https://www.kickstarter.com/projects/555543571/icampro-deluxe-revolutionary-smart-security-robot. Amaryllo will demonstrate its award-winning home security robots and smart home security cameras under robotic section at 72348 Sands Expo level 2 at CES 2016 from Tuesday, January 6 to Friday, January 9. To reserve a private product demonstration or to receive product details, please contact Amaryllo at sales.ai@amaryllo.eu. Amaryllo International B.V. (Amaryllo) is a worldwide leading smart home robotic security product company. Founded in Amsterdam, the Netherlands with facilities in Asia, Amaryllo develops award-winning WebRTC home security products and is a licensee of Apple MFi, Skype Developer, Windows Developer, Google Play Developer, UPnP, Bluetooth SIG, etc.